I've basically finished the DM Handbook - Still missing the treasure and monster book, but these should not be needed for review and testing. All the player material, save a bit of art and layouting in the magic booklet, is done. SO - Anyone who would like to try out, or simply take a look at, a hack of 5e that harkens back to the simple days of B/X - where the rules properly support old-fashioned dungeon crawls and hexcrawls (and make them easy to run). Where reaction rolls, morale and race-as-class is still a thing. 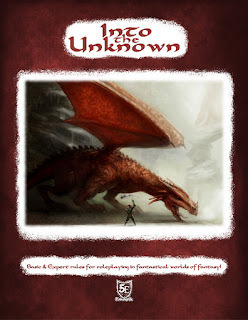 Sign up to playtest "Into the Unknown"! Just join the playtest group here, and all the files will be made available to you. Any and all feedback is greatly appreciated. Both there and on the blog, I will also be sharing designer notes in the upcoming weeks.